The tooltip of the danger level display in the UI is giving some information about the complaints. 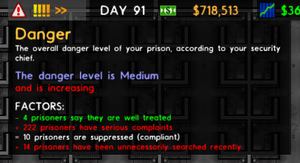 The overall level of hostility in your prisoner population is displayed at the top of the screen after you have hired a Security Chief. If moused over, the indicator will provide additional information such as the number of complaints, satisfied inmates, and recent punishments which have been handed down. Danger or commonly temperature level increases as needs go unmet. You can lower the danger level by providing additional amenities, allowing more time in the regime to satisfy certain needs, or by hiring more guards to deal out punishments. When the danger level rises too high, then it is recommended to lower it fast or there may be an unexpected full-scale riot, depending on how many prisoners are angry because of their unmet needs. Prisoners have critically unsatisfied needs. A Riot is occurring nearby. Riot Police are on site. Armed Guards are in service. There was a recent death in the prison. Prisoners are searched without finding anything. Nearby fights - prisoner vs prisoner or prisoner vs staff. Staff members who are dissapointed in their job. Prisoners who feel they are well treated (all needs met). Prisoners who had a good meal. Prisoners who have been calmed recently from the Chapel. Staff members who are satisfied in their job. Prisoners are locked up for no reason, which is caused by activating Bangup. If staff needs are enabled, staff being pissed off also increases the danger level. The effect is less strong as for prisoners, though. Staff being well taken care of will have a calming effect on the prisoners as well. Choosing The Pacifier as a warden permanently reduces the danger level by 25 points, plus he is calming prisoners nearby himself. This page was last edited on 29 June 2018, at 20:48.